This summer, MaRS Data Catalyst launched the Connected Entrepreneur Survey to help us understand the role that connections play in making startups successful and to recognize the many entrepreneurs who build and shape entrepreneurship communities across Ontario. As a member of the Global Entrepreneurship Research Network (GERN), MaRS is mapping the complex connections between entrepreneurs, mentors, investors, educators and governments. Using the data we gather, we’ll create interactive maps of cities in Ontario, similar to the visualization tools created by GERN for other major cities, such as New York City and Cairo. There are some fundamental gaps in our understanding of how entrepreneurship clusters develop and evolve over time. We know that networks are inherently important for startup success, but we have little data to substantiate this knowledge. The survey is also part of a global ecosystem connections mapping project that has the goal of mapping 100 cities in the next five years. This initiative will provide comparable data on leading entrepreneurial cities around the world, enabling us to better understand the characteristics and factors that make entrepreneurs successful and to set global benchmarks to provide more meaningful measures going forward. The Data Catalyst team took a crack at one of the first cuts of the data from the survey. 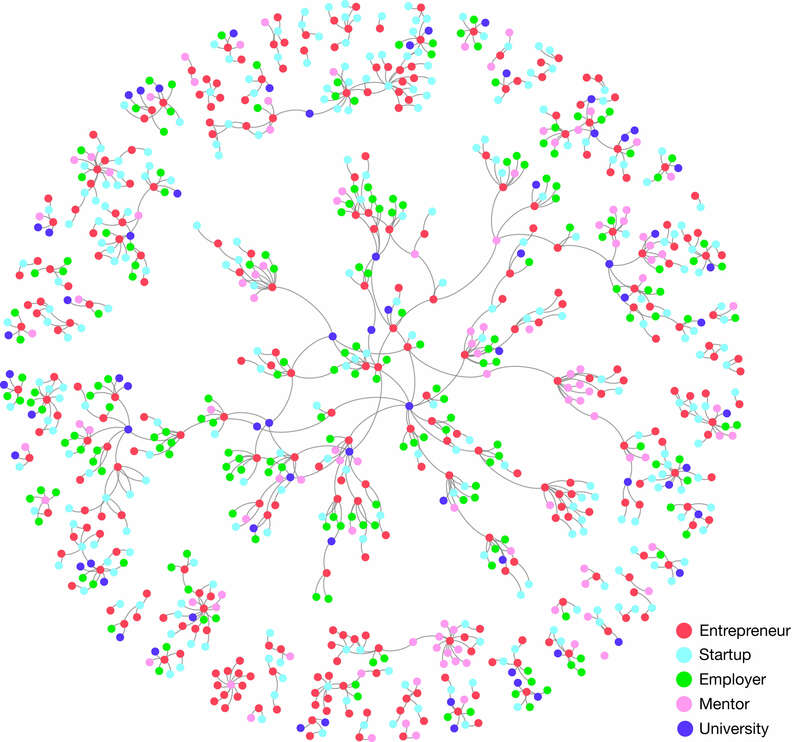 We found 943 nodes (entrepreneurs, mentors, employers, startups and universities) and 908 relationships across the network. [i] This blog post provides a first look at Ontario’s network, with a focus on universities and their roles in the entrepreneurship ecosystem. It’s important to note that these results do not capture all of the potential connections in the ecosystem, as the Connected Entrepreneur Survey is still live and collecting responses. Make sure you aren’t left off the map—take the survey now! In the current data, only 0.1% of the connections that could exist in the ecosystem actually exist. One of the goals of this project is to identify important types of connections and to help purposefully facilitate some of the interconnections between important members in the ecosystem, creating a denser, closer-knit ecosystem. On a closer look, we can see that there are a few parts of the network that are well connected. The largest component here consists of 359 individuals/organizations and 371 relationships. Twenty-four universities are at the centre of this largest component—many entrepreneurs appear to have attended multiple universities, likely one for their undergraduate degree and others for postgraduate studies. Which universities influence entrepreneurship in Ontario? Much of the activity in the current network appears to be centred around a few important universities. 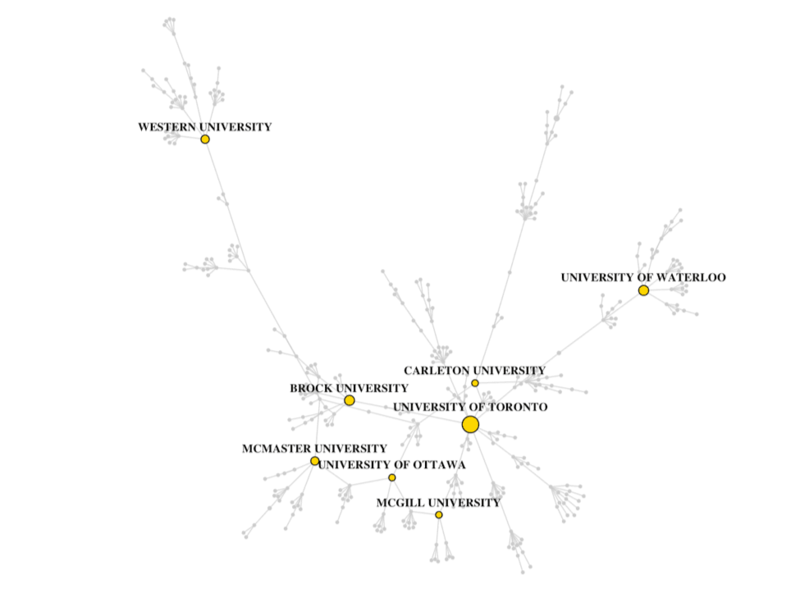 In this particular case, we measured the “local” importance, or degree centrality, of a university—that is, the total number of connections of a particular university. Unsurprisingly, some of the top universities in Ontario feature quite prominently, such as the University of Toronto, the University of Waterloo and Brock University, to name just a few. Which universities do influential entrepreneurs in Ontario come from? When we measured the “global” importance, or the Eigenvector centrality, of universities, we got a slightly different picture. In this case, a university is of higher importance if it is also connected to important individuals. 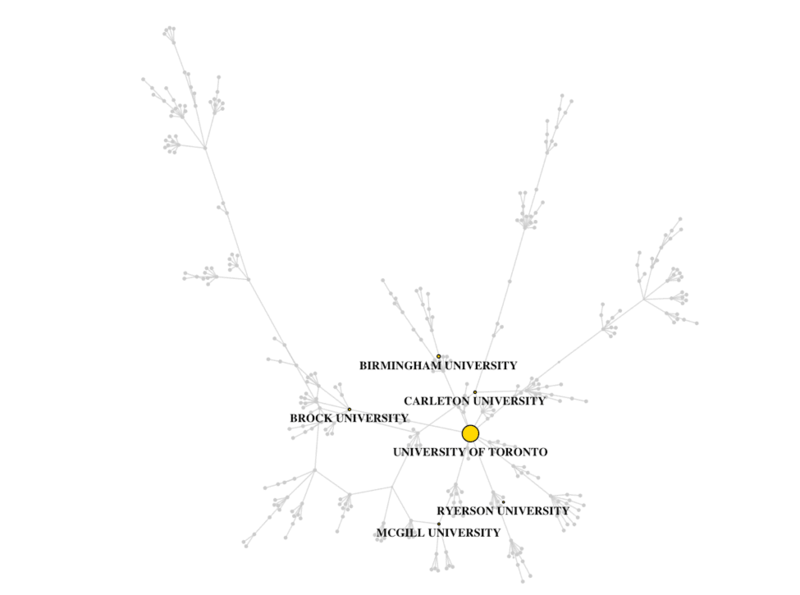 In this sample, the University of Toronto edges out other universities in this regard, as it appears to be connected to a large number of important, well-connected individuals in the network. Is your alma mater on the map? Do you think it should rank higher? These visualizations are entirely driven by your responses. Make sure your university’s important contributions to entrepreneurship and innovation in Ontario are recognized by taking the survey! Data Catalyst will continue to develop insights into various types of relationships within the ecosystem. Watch this space to see which mentors have supported the success of entrepreneurs in Ontario. 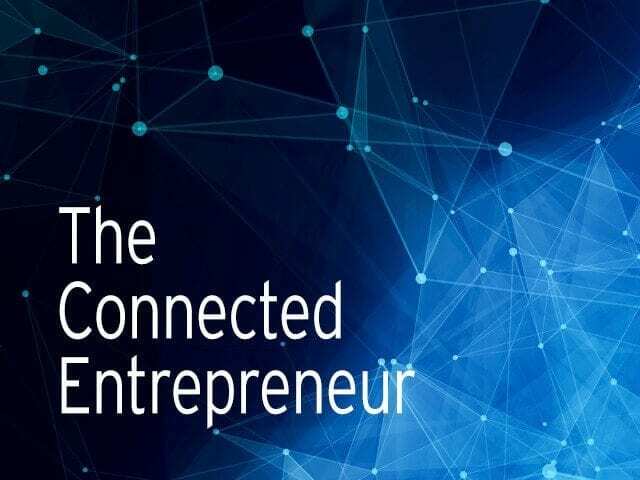 As mentioned, the Connected Entrepreneur Survey is still live and we’ll be collecting responses until December 2016. The resulting outputs are as interesting and accurate as the information you provide. Your participation in the survey will go a long way toward putting Ontario’s entrepreneurial cities on a global stage. By participating, you’re not only recognizing and celebrating the individuals and relationships that have supported your startup journey, you’re also helping potential newcomers in this space—your peers—by contributing to an invaluable map that will enable them to better understand the ecosystem and more easily see the support their communities have to offer. What are the most important predictors of success for entrepreneurs? What is the impact of local accelerators and incubators? Are specific programs or individuals significantly more influential than others? How does each individual ecosystem compare to other ecosystems around the world? If you’re an employee or affiliate of an organization that works with entrepreneurs in some capacity, you can help further this initiative by sending the survey to your networks. You can also contact Malavika Kumaran at mkumaran@marsdd.com for more information. [i]. These numbers do not include individuals or organizations mentioned as being an inspiration to the entrepreneurs who responded to the survey. [ii]. Data accurate as of 29-09-16.